Brian Reith, better known as B. Reith, is a TobyMac discovery. Making his brand of hip-hop music since 2003, he was signed to Gotee records in 2008 and subsequently released the Forecast EP. Now it is finally time to see what he can spin on a full-length album, his new release Now Is Not Forever. Like any good hip-hop album, Now Is Not Forever kicks things off with a funky intro track, introducing Reith's poppy soul vocals over some catchy organ. "The Comeback Kid" jumps in immediately with some heavy synth and a driving beat. Here we get the first taste of Reith's rapping abilities, which are respectable. This is also the first taste of his clever lyrical ability, with lines like "I never thought I'd say I got too many fans. You can thank my face for that. I mean, wait, MySpace, Facebook." The chorus has Reith reaching higher into his range but sounding smooth throughout. "I Know" takes things in a more pop direction, and Reith's vocals particularly stand out in this track as he spins a catchy yet relaxing melody in the chorus. Things get simpler when "Mess" starts, and we hear just Reith's voice and an acoustic guitar. "Antidote" moves closer to a pop rock sound, with a persistent piano line and some backing electric guitars. This musical diversity shows itself throughout the album, with Reith moving from hip-hop to soul to even worship. The execution is excellent throughout, with Reith showing that he has a secure handle on each of the varying styles on the album. Similarly, Reith takes his lyrics in many directions. Typically, there are tracks like "The Comeback Kid" and "Old School," where he is mostly rapping about himself and his abilities. Fortunately he also manages to maintain a humble undertone in these tracks. "U Should Know" is a simple romance song, followed immediately by "Wish That," which speaks of regrets in a previous relationship. "Antidote" is both heavy and encouraging, reflecting on people looking for hope in their life and clearly pointing towards Jesus. "Rain Down" has a worship feel, with a message as simple as its title. "Just For You" is a highlight with its honest lyrics and sincere statement of commitment to God. Curiously, B.Reith also seems to have an interest in accused murderers, with two references to O.J. Simpson and one mention of Jeffrey Dahmer. The line "Just call me O.J., I had to take a stab at it" will probably leave listeners scratching their heads. Now Is Not Forever is an excellent album. There's a little bit of everything here, and the songwriting is catchy and tight. Reith's vocals are also very pleasing to the ear. 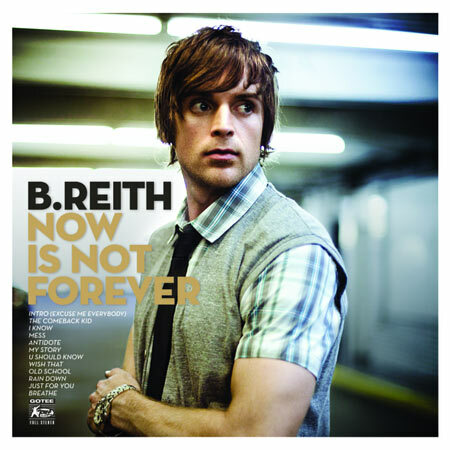 Couple this with lyrics that are both fun and deep, and you have a more than satisfactory debut album for B. Reith.